Experts call this gemstone composition a “Basic Mixture” used universally for energizing water. The soft, pleasant taste of this gemstone water tops off the positive experience in a sensual manner. This basic, well-balanced composition was used to for hundreds of years to inspirit water. Experts claim that amethyst stimulates and soothes the mind and emotions and that rose quartz fosters tranquility. Having this original vial and a decanter by VitaJuwel on your dining table or office desk will let you experience drinking water in a totally new way. Most customers find gemwater made with this harmonic blend to taste smooth and mild. If you're unsure, with which blend to start your VitaJuwel collection, choose this one! Hint: Our elegant decanters are adapted for our VitaJuwel vials in form and size. The decanters are consequently following our philosophy by being handcrafted of pure glass, free of harmful substances and holding a generous 1.3 liters. 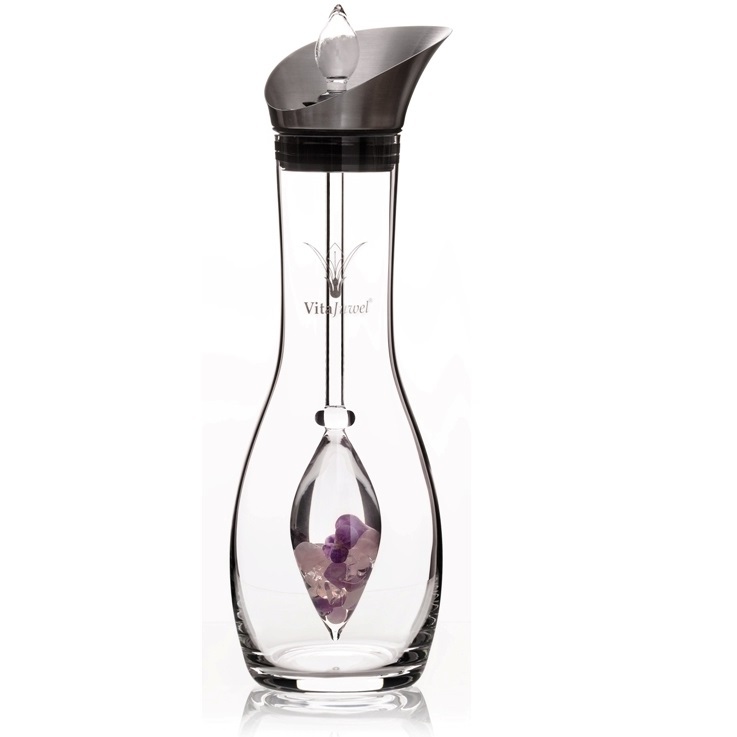 The round inner edges on the decanter bottom help to prevent a VitaJuwel vial from hitting the decanter wall.